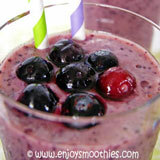 Banana blueberry smoothies have become one of my favorite smoothie combinations. These sweet, juicy little blue morsels pair very well with bananas. Bananas are often used as a thickener for smoothies, but they also add their own unique flavor. But do use very ripe bananas, the skins should be starting to blacken. As bananas take on a much sweeter flavor when ripe, they will add some sweetness. I also threw in some other berry fruits for slight variations, and each new recipe was just as delicious as the others. 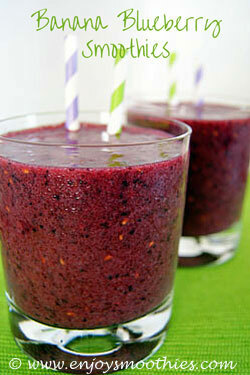 Adding other fruits also means your smoothie won’t need any extra sweetener. What else can you throw into your blender? Try using nut milks rather than ordinary milk, and for a tropical twist, coconut milk or water goes beautifully with blueberries. 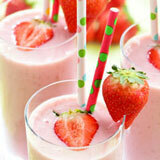 If you like your smoothies extra thick and creamy, add some Greek-style yogurt. Yogurt not only makes smoothies creamier, but also add its own unique taste. But if you prefer to go dairy-free, there are plenty of options. 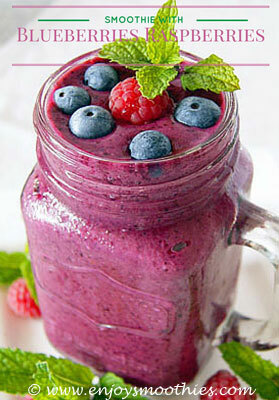 Place the blueberries, banana, yogurt, and almond milk in a blender and process on low first to break up the frozen fruit. Then turn up to high and blitz until smooth and creamy. 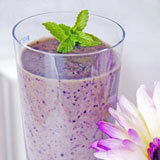 Taste your smoothie and if your taste buds say “Yes, it needs more sweetening” then add the honey. 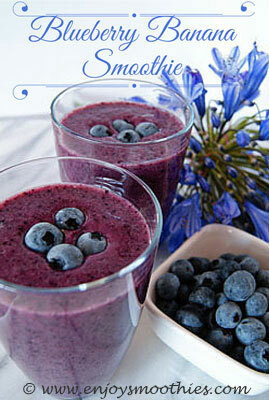 Place the frozen blueberries and raspberries in the blender first. Then add the banana, yogurt and almond milk. Start blending at low speed until the frozen fruit is broken down, then turn the blender up to high and continue blending until your drink is smooth and creamy. Makes one large glass or 2 smaller glasses. 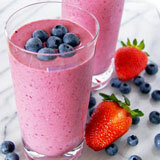 Place blueberries, raspberries, chopped banana and cranberry juice into a blender. Blend until smooth and creamy. Place blueberries, mixed berries, chopped banana and coconut milk into your blender jug and blitz until all the ingredients are smooth and creamy. Pour into 2 glasses sprinkle over shredded coconut and serve. 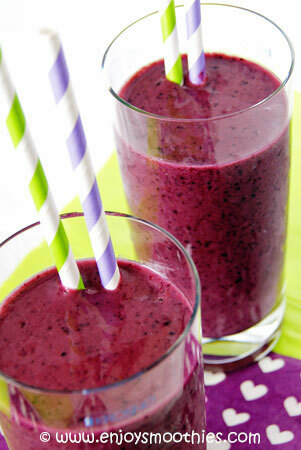 Using frozen fruit will thicken your smoothie and give it that characteristic chill.